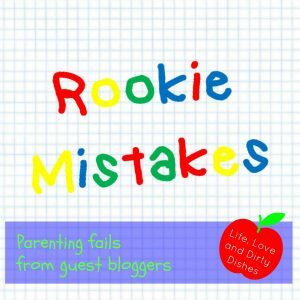 The series all about the parenting fails and rookie mistakes that prove there really is no manual for this job. My first child never showed any interest in trying to use the potty. We encouraged her to go at home and she would sit on the toilet at daycare several times a day, but nothing ever happened…for almost a year after we started trying. As she approached her 3rd birthday we started feeling the pressure from family, friends and teachers, but I continued to defend my position of not pushing her since she didn’t show any of “the signs.” Shortly after her 3rd birthday, as I began to think about her being excluded from summer programs because she wasn’t potty trained, I realized we should probably begin. We decided to do an intense weekend of nakedness (except for the new My Little Pony underwear), puddles, and a sticker/M&M chart, and she completely caught on. By Monday she was set, and she only had a few accidents in the weeks that followed. I have to admit I felt quite smug thinking I had stuck to my instincts and waited till she was ready, because I was clearly so “in tune” with her behavior and signs. With my second child, the signs came very early after her 2nd birthday. She liked to imitate what her sister was doing in the bathroom, she loved goofing off and singing on the toilet, and before we knew it, she actually went a couple of times! Aha! Because I knew my daughter so intimately well, and because I was so well connected with her behavior and inner motivations, I realized this was clearly the moment to commence official potty training. My husband and I picked a weekend. Friends volunteered to watch our oldest so we could focus on the training, but we declined their offers because we knew it wouldn’t be necessary. I briefly thought about buying a few more pairs of underwear but then reminded myself that they wouldn’t be needed either. I literally started salivating just thinking of all the money we were going to start saving by not buying diapers anymore. To say we were overly confident that this would be an easy weekend was an understatement. Looking back, I probably should have realized that things were going to go differently with this one when my daughter went potty on the toilet well before our timer had gone off. She just walked over and went, and smiled somewhat eerily. What was this? Was my daughter some genius, some prematurely developed master of her own body and mind? I smiled excitedly at my husband. Just then, with the smile still on my face, my daughter ran and ripped down the chart we had posted on the wall and threw it at us, laughing diabolically. Hmmm… strange behavior for such a highly developed and mature child. I just shrugged and started the timer again. The next time the timer went off, she was hiding under a table, yelling to us that she had peed a little in her underwear. We gently coaxed her into the bathroom, but she resisted, like a wild animal. We persisted, changed her underwear, and encouraged her to try again. For the next 36 excruciating, hopeful-but-quickly-dissolving-into-hopeless hours, we continued in the same fashion. With each attempt my daughter more loudly yelled from her spot in the house that we needed to change her underwear, barking orders like a drunk person at a bar. She resisted sitting on the potty more and more, and we (so, so naively) persevered. Don’t they say to not go back when you are trying to change a behavior? Don’t they say you’ll lose all your gains if you give up? Wouldn’t we ruin everything (our lives included) if we didn’t continue our training? The culmination of our potty training weekend came during one beautiful, wet moment. My husband and I were trying to attend to my older daughter and also start to get dinner ready. Since my youngest was crossing her legs and starting to run away from us, we figured she needed to go, so I went to corral her. The same battle ensued, and she ran away from me into the kitchen where my husband was gathering ingredients. She called my name and her sister’s name, so we all came to the kitchen to see what she wanted. There we were, gathered around her like an audience, wondering with eager anticipation what was going to happen. She stood, like a magician about to perform, with a slight smile on her face. In the blink of an eye, before we could do anything, she pulled down her underwear and started peeing, like a fountain, on the kitchen floor. As the pee splattered on the tile in every direction, I remember thinking that I hoped my new slippers were okay to go in the laundry. Sigh. Dejected and exhausted, I reached for a diaper and handed it to my daughter. “Here, love. Do what you want. Wear this, or don’t wear it. It’s your choice. You decide when you’re ready.” She laughed and left the room to play with her toys, and we sauntered away to get the paper towels, and a drink. I won’t say I gave up at that moment. What happened was that I think I gave in. To my daughter and who she is, and her timeline. As has now become clear to me, my youngest does things on her terms. She has fierce autonomy coarsing through her veins and she doesn’t stop until she is satisfied with what she’s done. She runs the show. It doesn’t matter whose show it is, or where it is, but she runs it. And what I learned that weekend, is that the potty show is no different. Epilogue: We used a diaper the rest of the night, and the next morning my daughter asked for underwear. She went straight to the potty before daycare and peed. She’s been potty trained ever since then. Lisa Edwards is a mom to two young daughters, as well as a psychologist and professor at Marquette University in Wisconsin, US. She has had her fair share of rookie mistakes and continues to get a good laugh (and cry) about how challenging parenting can be. Lisa’s passion is supporting moms through her blog, Hopeful Mama, and through counseling and being a volunteer on the Spanish Warmline for Postpartum Support International. You can follow Lisa on her Twitter and Facebook pages, and check out all her resources on Pinterest. You can read previous guest posts from the Rookie Mistakes series here. If you are a blogger and wish to take part in the series you can find out more here. Haha! It seems clear to me that she was trained… in a Pavlovian way. When the timer went off, she peed in her underwear! Just like a potty training version of Pavlov’s dogs. My eldest showed no interest in potty training either, and was trained late. The little one has also showed much more signs of readiness. She has just turned 2 and, unlike her sister, she has reported when she has weed or pooed in her nappy for months already, and likes to sit on the potty and try. I’m contemplating starting her training, but suspect it would go a similar way to your experience, as she is also a wilful little thing! My two only have a year between them in age, so eldest is only recently trained at 3, and not sure can face trying youngest yet!